Casein and whey are two types of proteins that can be obtained from mammalian’s milk, but a difference can be noted between them based on their rate of digestion as well as their amino acid profiles. During milk coagulation process, milk protein can be divided into semi-solid lumps and a liquid portion. The semi-solid lumps represent the casein also known as milk curd. Liquid portion represents the whey protein. The main difference between casein and whey protein is that Whey is digested and assimilated more rapidly by the human intestine and may be more favorable when consumed immediately after heavy exercises or workouts while Casein is a slowly digesting protein that is used less efficiently by the human intestine compared to whey protein. In this article, let’s further elaborate the differences between casein and whey protein. Casein is a milk protein which is also known as a slow-acting protein. It is slowly digested, and it slowly releases amino acids into our blood stream. Casein is present in milk curds, and it is the most abundant protein in milk. Its amino acid profile is different from whey protein. However, it is mainly high in glutamine, which is a conditionally indispensable amino acid. Glutamine is important when the human body is put under physiological stress due to endurance exercises, and the body wants to obtain glutamine from an external food sources. Whey is also known as a fast-acting protein because the human intestine can break it down and absorb the nutrients in a relatively quicker rate than casein. Whey protein is accumulated in the liquid portion of milk. Nowadays, manufacturers break down whey even further, which is known as whey protein isolate, whey concentrate or whey powder. They are sold in different forms as nutritional or sports supplements. Several research studies have shown that whey protein sports supplements may be associated with an increase in the muscle mass size and strength in sports persons. 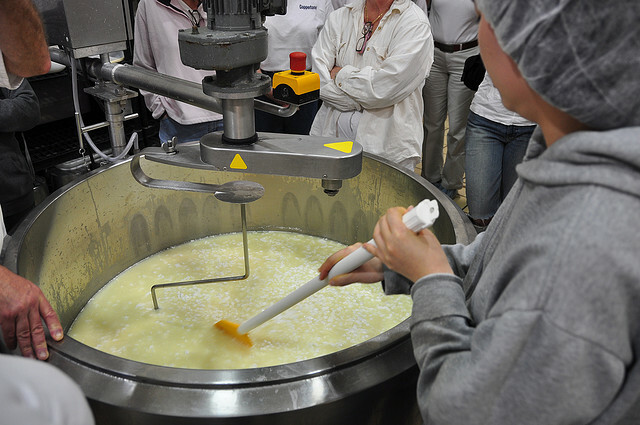 Whey is a by-product of cheese processing, and when cheese is prepared, a thin liquid is removed which is known as whey. It is usually concentrated and dried, in order to produce a whey protein powder. Casein and whey protein may have significantly different physical and functional characteristics. These can be categorized into following subgroups. Casein: This is also known as slow-acting protein, anti-catabolic protein. Whey Protein: This is also known as fast-acting protein, anabolic protein. Casein: semi-solid lumps of the coagulated milk represent the casein. Whey Protein: Liquid portion of the coagulated milk represents the whey protein. Casein: A glass of cow’s milk contains 80% casein or milk contains more casein compared to whey. Whey Protein: A glass of cow’s milk contains 20% whey or milk contains less whey compared to casein. Casein: Casein is slowly digested and absorbed by the human intestine compared to whey. The prolonged digestion of casein is attributed to a delayed gastric emptying. Whey Protein: Whey is rapidly digested and absorbed by the human intestine compared to casein. Casein: Casein is hydrophobic in nature and poorly soluble in water. Whey Protein: Whey protein is hydrophilic in nature and soluble in water. Casein: Casein inhibits the breakdown of protein. Whey Protein: Whey stimulates protein synthesis. Whey Protein: Compared to casein, whey is not a rich source of glutamine. But whey has a higher leucine content, an effective amino acid that stimulates protein synthesis. The amino acid cysteine in whey protein is a substrate for the production of glutathione in the body. Glutathione is a universal cellular antioxidant. Casein: Biological value of protein measure of how efficiently that protein can be utilized by the human body. The biological value of casein is 77 which is less than whey. It also means that casein is used less efficiently by the human body when compared to whey. Whey Protein: The biological value of whey protein is 104 which is greater than casein. Casein: Casein is a major component of cheese. Whey Protein: Whey protein is a by-product of cheese making. Casein is used as a food additive, as a binder for safety matches, used as paint by artists, production of casein-based glues, casein-derived compounds are used in tooth re-mineralization products and as nutritional supplements. Whey Protein is used as a nutritional supplement. Casein: The major allergens in milk are the caseins. Whey Protein: This is responsible for some milk allergies. Casein: Casein is not coagulated/denatured by heat. Whey Protein: Whey protein can be denatured by heat. In conclusion, Cow’s milk is composed of two main dairy proteins known as casein and whey. The key difference between them is the digestibility. However, nutritional supplements should contain both whey and casein so that the body can take full advantage of milk protein at different absorption rates. Moreover, the combined efforts are favorable because whey acts to stimulate protein synthesis whereas casein inhibits the breakdown of protein. Anders H. Forslund, Leif Hamraeus, Roger M. Olsson, Antoine E. El-Khoury, Young-Ming Yu, and Vernon R. Young (1998). The 24-h whole body lecine and urea kinetics at normal and high protein intakes with exercise in healthy adults. Am. J. Physiol Endocrinol. Metab. 38, E310-E320. Bohe J., F. AiliLow, R.R. Wolfe, and M.J. Renne (2001). Latency and duration of stimulation of human muscle protein synthesis during continuous infusion of amino acids. J. Physiol, 532, 2, 575-579. Dangin M., Biorie Y., Rodenas-Garcia C., Gachon P., Fauquant J., Callier P., Ballevre O., and Beaufrere B (2001). The digestion rate of protein is an independent regulating factor of postprandial protein retention, Am. J. Physiol. Endocrinol. Metab, 280, E340-E348. Boirie Y, Dangin M, Gachon P, Vasson MP, Maubois JL, Beaufrere B. (1997). Slow and fast dietary proteins differently modulate postprandial protein accretion. Proc Natl Acad Sci USA, 94 (26):14930-5.